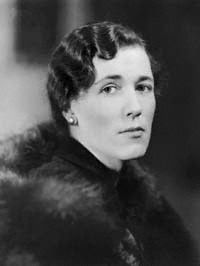 I’ve always loved the novels of Georgette Heyer for their wit, well-researched period detail, terrific story-telling and escapist fun. And I am not alone. 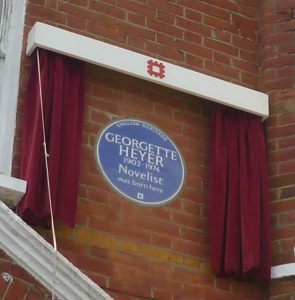 When, in June 2015, I attended the Blue Plaque ceremony at 103 Woodside, Wimbledon, where she was born, Stephen Fry, a great fan, did the honours, opened the red curtains to reveal the plaque and spoke enthusiastically of Georgette Heyer’s stylish and witty novels. He’d discovered them at school and has loved them ever since; he finds them great comfort reading if ever he’s under the weather. 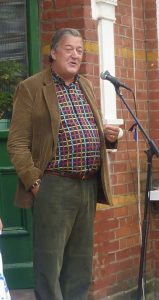 There were many appreciative messages from people who couldn’t be there, including Antonia Byatt and Nigella Lawson. I also met Professor Mark Noble from Aberdeen University (an authority on the science of the cardiovascular system), who’d come down from Scotland especially for the ceremony. He’d been given a Georgette Heyer to read when recovering from flu as a teenager, and has been a fan ever since. 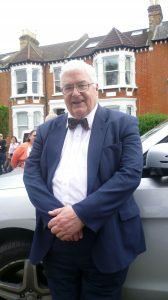 He looked very dapper, as befitted the occasion – I’m sure Georgette Heyer, very stylish herself, would have approved. So why am I having a problem with April Lady when so many eminent people love her books? It has more or less the same plot as The Convenient Marriage (1934); and the heroine, Nell, is rather too quiet and subdued. Her personal problems (debt, her husband’s supposed mistress, thinking he doesn’t love her, and so on) make it difficult for her to be proactive. As a novelist myself, I can see the technical problems here. I can accept all this. What I find difficult, though, is that, in the last few pages of the book, the hero Giles, Nell’s estranged husband, allows his very young and flighty half-sister, Letty, to marry the proper but ineligible Jeremy, and go with him to Brazil, of all places. Letty is headstrong, self-centred, spends money like water (fortunately, she’s an heiress) and frankly, is a pain. Jeremy Allandale is a very proper young man of good, but impecunious, family. He has a mother and sisters to support, and must make his own way in the world. When he’s offered a position (he’s in the Foreign Office) as a secretary in Rio de Janiero, he accepts it. It’s a step up for him but it means he will be in Brazil for a couple of years. Very sensibly, Giles has hitherto refused to allow an engagement between Letty and Jeremy. She, after all, is only seventeen when the story opens. So why does he backtrack in the last few pages and allow them to marry and Letty to sail to Brazil with Jeremy? 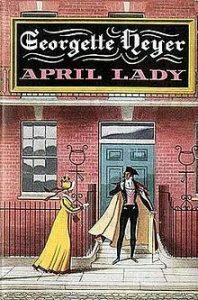 Cover for first edition of April Lady. My own copy is a first edition bought for 45p. It’s bonkers! She doesn’t speak Portuguese, she’ll know nobody, she won’t have a clue how to go on in diplomatic circles (crucial if Jeremy is going to get on in his career), or how to run a house or organize servants, and she is completely ignorant about money. And what happens when she gets pregnant? Remember, Jeremy will be at work all day. Yours truly in front of 103 Woodside. 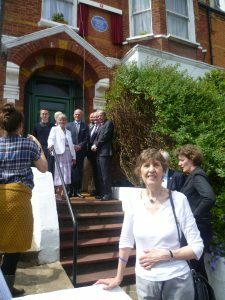 Georgette Heyer’ family on stairs behind. When I was a teenager, none of this worried me; I just thought that Nell and Giles would be relieved to be free of the constant worry about what Letty was getting up to. Nowadays, I think that Giles abandoning his responsibilities towards Letty is disgraceful. OK, she is tiresome, badly-brought up, etc. but she is very young, and, like it or not, he is responsible for her. This is exactly what Letty needs. And, in return, Giles and Nell will give Jeremy’s sisters a splendid Season. I offer this in some trepidation but I cannot be the only person to find Giles’ behaviour here worrying. And I doubt if I’m the only novelist to invent further scenes featuring characters from her inimitable novels. Photos by author, apart from the first. I stumbled across The Corinthian when I was thirteen and having an unhappy time at boarding school – I’ve adored Georgette Heyer ever since. I much prefer your ending to April Lady though; Giles is one of GH’s strong, silent heroes, whose every move breathes integrity, so when he shrugs off his responsibilities towards Letty it’s a bit of a puzzle. Her books are so well written and so funny – I think it’s wonderful that her work has been treasured by men and women alike – it’s no surprise that her fans number Stephen Fry and eminent cardiovascular specialists. My favourite heroine is the Grand Sophy – I would love to have her as a friend – kind, vivacious, stylish, and perceptive – she’s just the person to blow all the blues away and bring sunshine into the room. If she would join my circle of friends, together with Kitten (Friday’s Child) and Kitty (Cotillion) it would make me very happy, especially if Sherry, George, and Freddy came along too.. Thank you for your comments, Prem, which made me smile – especially about unexpected male Heyer fans. I do agree, especially about Freddy, who I think is a poppet. And I’m quite sure that Sophy would sort out one’s love life in a jiffy – and probably by a highly unorthodox route!